The last Blue and Gray Magazine issue from Vol. 30 will ship this week. The subject is the Battle of Tupelo and the author Tom Parson. Parson also has a book length treatment of the same coming out the following month (good timing) -- Work for Giants: The Campaign and Battle of Tupelo/Harrisburg, Mississippi, June-July 1864 -- through Kent State University Press. 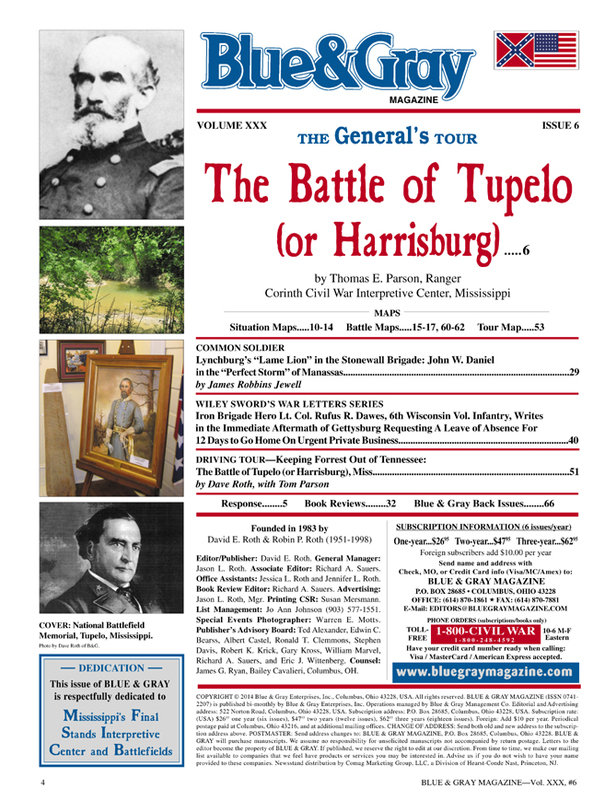 The magazine usually does a fairly good job of varying theaters, but this one will also mark the 15th issue since the beloved General's Tour last ventured into the Trans-Mississippi. I hope the wait for another visit won't be too much longer. 1. Winnie Davis: Daughter of the Lost Cause by Heath Hardage Lee (Potomac Books, 2014). According to the press release, this is the first biography of the famous "Daughter of the Confederacy" to appear in print. After spending much of her life abroad, "(h)er controversial engagement in 1890 to a Northerner lawyer whose grandfather was a famous abolitionist, and her later move to work as a writer in New York City, shocked her friends, family, and the Southern groups who worshipped her. Faced with the pressures of a community who violently rejected the match, Winnie desperately attempted to reconcile her prominent Old South history with her personal desire for tolerance and acceptance of her personal choices." 2. Collaborators for Emancipation: Abraham Lincoln and Owen Lovejoy by William F. Moore & Jane Ann Moore (Univ of Ill Pr, 2014). The younger brother of famously murdered abolitionist newspaper editor Elijah Lovejoy, Illinois's Owen Lovejoy became a prominent antislavery radical himself. This study examines in depth the Lovejoy-Lincoln connection. "Exploring the men's politics, personal traits, and religious convictions, the book traces their separate paths in life as well as their frequent interactions. Collaborators for Emancipation shows how Lincoln and Lovejoy influenced one another and analyzes the strategies and systems of belief each brought to the epic controversies of slavery versus abolition and union versus disunion." The Moores are co-directors of the Lovejoy Society and editors of his papers. 3. "Stand to It and Give Them Hell": Gettysburg as the Soldiers Experienced it from Cemetery Ridge to Little Round Top, July 2, 1863 by John Michael Priest (Savas Beatie, 2014). During my early Civil War reading, Priest's Antietam: The Soldiers' Battle was one of my favorite books. 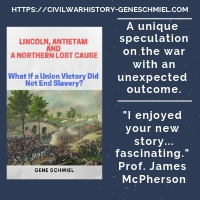 This new study follows a similar format of presenting the action through the eyes of individual soldiers, with the field of battle being the second day of Gettysburg at Cemetery Ridge, the Peach Orchard, the Wheatfield, Devil's Den and other famous July 2 locations. The professionally produced maps are a big upgrade from the hand-drawn affairs present in the author's earlier books. Merchant: "SOUTH CAROLINA FIRE-EATER: The Life of Laurence Massillon Keitt, 1824-1864"
South Carolinian Laurence M. Keitt is mostly recognized by Civil War readers as a second tier Deep South Fire-Eater who assisted Preston Brooks during the infamous Sumner caning incident and suffered a mortal wound at Cold Harbor leading a poorly orchestrated frontal attack. Concise, but well researched and offering a comprehensive portrait of Keitt's public career, Holt Merchant's South Carolina Fire-Eater: The Life of Laurence Massillon Keitt, 1824-1864 is a compelling biographical treatment of a man supremely dedicated to disunion but, after achieving this cherished goal, could only watch as others seized the reins of the new Confederacy. Before entering the national scene, Keitt was a lawyer and state legislator. According to Merchant, the records of Keitt's cases were destroyed during the war so it is not possible today to adequately assess his level of ability or his place in any important cases. Much like his later time with the U.S. Congress, Keitt's career as a state lawmaker was fairly undistinguished, his most important achievement apparently being to fireproof the state archives. History was often on his mind and he hoped to be a published author at some point. 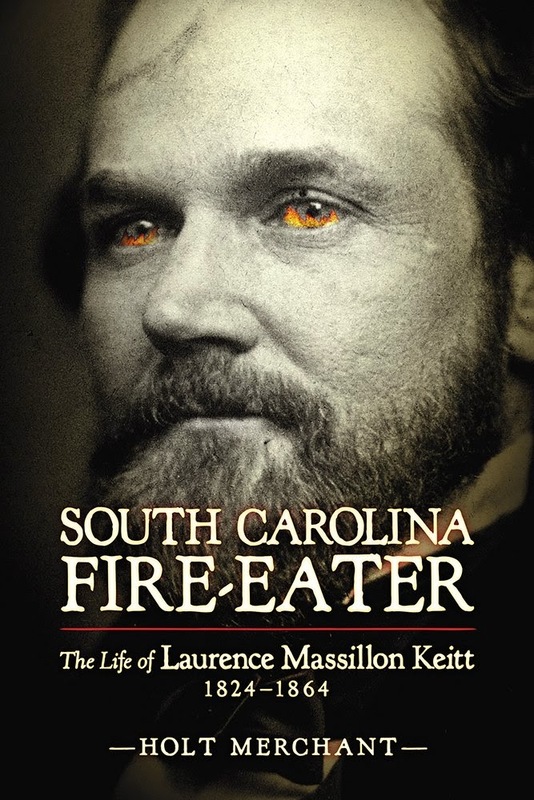 Merchant's characterization of Keitt's political actions and ideology offers readers a clear sense of what made South Carolina Fire-Eaters a different breed from even other Deep South leaders of similar persuasion. In the 1850s, wherever there was a crowd that would listen, he delivered fiery speeches denouncing all political parties (Republicans, Democrats, and Know Nothings alike). Keitt wanted his state to have no part in national political parties. As a U.S. Representative, sectional deal making was of no consideration, his only concerns tied to limiting the powers of the federal government and maintaining a fiercely partisan defense of the interests of South Carolina and slavery. Disunion always seemed to be the ultimate goal. As long as men like Keitt held sway during the 1850s, Merchant offers the impression that no compromise that could have led to South Carolina remaining within the Union was possible. Keitt's rhetorical skills undoubtedly had significant impact on the secession movement but any hopes of having a large role in shaping the creation of the new nation that he so tirelessly fought for were quickly dashed. Much of this was likely due to his ungovernable temper. Creating powerful enemies and almost entirely lacking in discretion, he was no statesman. As part of the South Carolina delegation in Montgomery, Keitt could only watch as others drafted the Confederate constitution and selected comparative moderates to high office. Briefing serving in the Confederate Congress, where he was an outspoken critic of the Davis administration, Keitt resigned in 1862 to enter the army. Appointed to lead the 20th South Carolina, Colonel Keitt spent much of the war defending Charleston. Centering on Sullivan's Island, his area of responsibility was the northern flank of the harbor defenses, the most quiescent sector. Keitt first serious taste of combat occurred when he was sent to Morris Island. There he was praised for his stalwart defense of the island and skillful extraction of the Battery Wagner garrison. Keitt's first opportunity to direct units in the open field was in Virginia at the Battle of Cold Harbor. Inexperience, combined with an urgent desire to prove himself as a battlefield leader, led him to launch a poorly crafted frontal assault against entrenched Union cavalry that failed badly, with brigade commander Keitt mortally wounded in the process. As he does not attempt a detailed reassessment of this attack and Keitt's role in it, Merchant likely believes that no reason exists to contradict the conventional interpretation. With notable breadth and depth of sources listed, the bibliography of South Carolina Fire-Eater has all the hallmarks of a well researched biography. Merchant uses the correspondence between Keitt and his wife to provide readers clues to Keitt's inner life. His letters to Sue often express genuine regret for those times when his temper got out of control. Curiously, in 1864, Keitt also became circumspect about how personally responsible he was for bringing about such death and destruction to his section, promising his wife that after the war he would devote himself to some form of redress. One wonders whether other Fire-Eaters expressed similar feelings. Still, it remains difficult to glean features of Keitt's personality, how he interacted with intimate friends and family, from the narrative. The book does not liberally allow Keitt to express himself in his own words, with Merchant instead preferring to synopsize the content of letters and other primary sources. Laurence M. Keitt is a Civil War era political and military figure deserving of a modern scholarly biography, and Holt Merchant's effort to provide one succeeds quite nicely. With its keen insights into Fire-Eater ideology, even those readers without a specific interest in Keitt himself will gain a deeper understanding of the political movement that, in its most extreme South Carolina form, came to be devoted to the destruction of the Union. Does anyone know the story behind its discovery? A cursory online search for news stories turned up nothing. I can see why it might remain under wraps until publication but I would have thought at least some kind of headline would have appeared between 2009 and now [the diary was one of the items reported missing from Cleburne's body when it arrived at Carnton]. Given Cleburne's popularity and with 1864 being the most controversial year of his celebrated Confederate service (with his proposal to arm slaves and high profile involvement and death during Hood's Tennessee campaign), it should be a pretty big deal. 1. From Vicksburg to Cedar Creek: The 22nd Iowa Volunteer Infantry in the Civil War by Thomas P. McKenna (Camp Pope Publishing, 2014). This is the first modern regimental history of the 22nd, an Iowa regiment that served in both western and eastern theaters. It is unusual for this publisher to release both cloth and paperback editions at the same time. 2. That Furious Struggle: Chancellorsville and the High Tide of the Confederacy, May 1-4, 1863 by Chris Mackowski and Kristopher D. White (Savas Beatie, 2014). The ECW crew takes their proven formula to the Chancellorsville battlefield. I hope they emerge farther west someday. On a related front, the co-authors wrote a great book about 2nd Fredericksburg and Salem Church which was published a short time ago. Jones & Sword, eds. 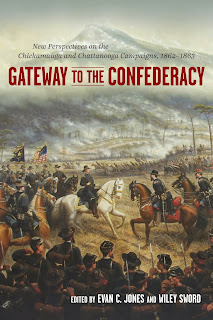 : "GATEWAY TO THE CONFEDERACY: New Perspectives on the Chickamauga and Chattanooga Campaigns, 1862-1863"
Edited by Evan C. Jones and Wiley Sword, the original essays collected in Gateway to the Confederacy: New Perspectives on the Chickamauga and Chattanooga Campaigns, 1862-1863 all connect in some fashion with the long and sanguinary Civil War struggle to control the strategic rail junction of Chattanooga, Tennessee, a town that could without exaggeration be crowned the "gateway" to the heart of the Confederacy. Publisher LSU Press does not typically publish Civil War military-themed article compilations [this reviewer cannot recall another], but, judging from the quality exhibited by this one, readers should earnestly hope for more to come. Given the military value of Chattanooga and sheer scale of effort devoted to its possession by both sides, it's a bit surprising that the recent trend producing scholarly city studies has not yet reached this particular East Tennessee town. Gateway to the Confederacy's first chapter does the subject ample justice in short form. Russell Bonds's thoughtful and elegantly written essay traces Chattanooga's regional development, from early Indian trading post to emerging transportation corridor to vital wartime strategic and political nexus. Bonds effectively drives home the location's indispensability to both local Tennessee River Valley industrial interests (primarily mines and nitre caves) and the most vital Deep South mines, mills, arsenals, foundries, etc. [a great pair of maps clearly illustrate this network]. Chattanooga possessed direct rail connections with the latter and also shielded them from enemy contact. The next contribution is Gerald Prokopowicz's account of the two Union attempts (one small and one large) to seize Chattanooga in 1862. While his description of events and assessments of the personalities involved are largely conventional in the broad sense, the author is more sympathetic than most to Don Carlos Buell's logistical difficulties as a reasonable limiting factor to his command's pace of advance. The game changing possibilities of an early 1862 capture of Chattanooga are also emphasized in a reasonable manner, although the confident assertion that it would have shaved a full year off the war's duration is unknowable given the infinite number of variables introduced by such drastic alternative history. Two essays in the book are written by Chickamauga expert David Powell. The first summarizes several themes (primarily involving the shortcomings of Nathan Bedford Forrest as close subordinate and corps commander) from his excellent 2010 study Failure in the Saddle, a pointed critique of Confederate cavalry generalship during the Chickamauga Campaign. The second is a fascinating treatise on the spirit of military invention and innovation in the Army of the Cumberland, a legacy of creativity that Powell credits William Rosecrans a great deal for fostering. In it, Powell examines evidence of an attempt by Rosecrans, ultimately thwarted by army regulations, to create a flying corps of elite, repeating rifle-armed battalions designed to counteract the huge numerical edge the Confederates maintained in cavalry in the department. Tactical innovations are also discussed, from the "advance, firing" technique first suggested by August Willich at the regimental level to the Cumberland army's more rapid and systematic adoption of the new 'Casey Method' of deploying brigades with shorter frontage and greater depth (a combination allowing more flexible use of reserves). Not joining the chorus of historians who dismiss Rosecrans as a leader stubbornly requiring gross levels of overpreparation before initiating movement, Powell is instead impressed by the general's unusually high level of campaign foresight, examples of this trait being Rosecrans's creation of topographical and pioneer/engineering assets of unmatched quality and his training of staff to expertly manage advanced depot systems for sustaining long campaigns. 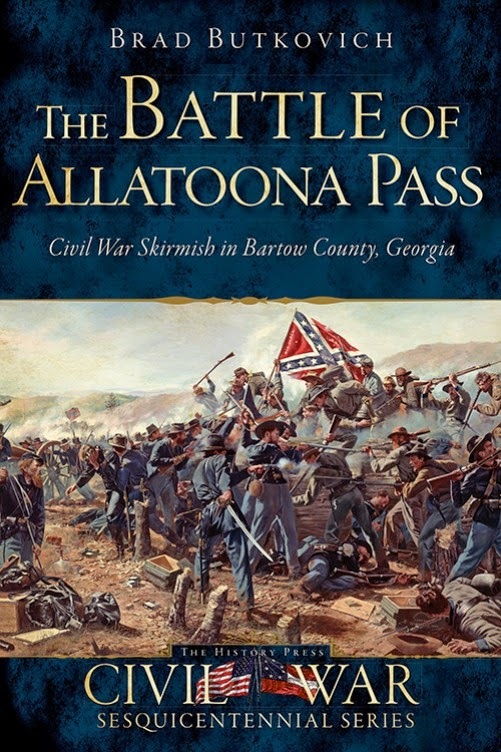 William Glenn Robertson's chapter invites readers to cast aside what they think they already know about two of the most controversial aspects of the Chickamauga battle (both occurring on September 20), Union general Thomas Wood's creation of the fatal gap through which Longstreet's assault column surged and Confederate general Leonidas Polk's delay in initiating Bragg's planned dawn attack. Widely regarded as the leading authority on the battle, Robertson persuasively argues that many of the details and assumptions surrounding these events that have repeated by historians are wrong. As a whole, the essay is yet another attention grabbing critique of historical writers that unquestioningly repeat established "facts", all too often selecting among competing sources those that tell the better story rather than those providing the most compelling evidence. The longest essay, and one of the best, is volume co-editor Evan Jones's comprehensive history of the decades long Rosecrans-Grant connection, from West Point origins to postwar political and military legacy rivalry. Meticulously documenting the relationship's transformation from one of apparent cordiality to implacable bitterness, Jones's treatment is both more fair and more measured in interpretation and tone than two recent book length studies covering the same subject. A departure from the historian's perspective is literature and poetry professor Stephen Cushman's reassessment of Ambrose Bierce through the latter's public and private writings. While elements of the type of tortuous literary deconstruction often painful to the memories of legions of undergraduates is present, the piece is accessible and quite engrossing. Cushman's study of the correspondence regarding Chickamauga between Bierce and budding historian Archibald Gracie leads him to cast doubt on Bierce's famed reliability. He also interprets Bierce's appreciation of D.H. Hill's writing style and the content of one of his lectures to a military audience to mean that the famously bitter Bierce was perhaps less disillusioned with his army experiences than previously believed. It is arguable whether similar degrees of historical scrutiny should be applied to both fiction and non-fiction writing in our assessment of Bierce's skills as a historian, but in Cushman's hands it is a fascinating exercise. Craig Symonds's chapter retells the story of President Davis's visit to the Army of Tennessee after Chickamauga and his failure to adequately resolve the latest eruption from the army's poisonous command culture. Wiley Sword's recounting of the long term consequences to Confederate fortunes of the crushing defeat at Chattanooga is remarkable primarily for insights related to Patrick Cleburne's much scrutinized proposal to arm slaves for Confederate army service that were found inside the general's recently uncovered diary [to be published in the future by Lee White]. Caroline Janney's final essay reminds us that, while the institutional face of commemoration at the Chickamauga and Chattanooga battlefields was one of reconciliation, partisan veterans of both sides remained defiant in maintaining the righteousness of their own cause and the wickedness of the other. Civil War essay collections dealing with key campaigns* already well covered in the literature invariably extol the presence of fresh ideas and new perspectives in their pages but Gateway to the Confederacy, with its greater than typical preponderance of truly original content, really does live up to the promise. It is highly recommended. * - As one can see from above, Gateway topics are weighted toward Chickamauga and the events leading up to it. 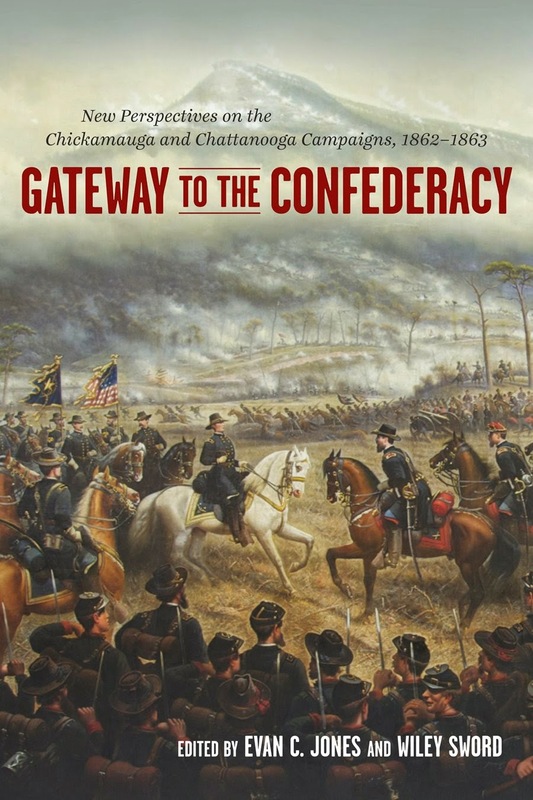 Those interested in essays more specifically related to the winter 1863 Chattanooga campaign and battle should consult The Chattanooga Campaign edited by Steven Woodworth and Charles Grear (SIU Press, 2012). The Union Army of the Southwest's lengthy march across the Ozark plateau from the Missouri interior to its victory at Pea Ridge has been well documented. Less well covered is the long range operational redeployment that shifted the base of General Curtis's advance into the Arkansas interior from the NW to NE corner of the state. Camp Pope Publishing recently announced a new book project (by frequent Civil War in SE Missouri author Robert Schultz) on this very subject. It might nicely serve to bridge the gap between a pair of exceptional works, Shea & Hess's Pea Ridge campaign study and Akridge & Powers's A Severe and Bloody Fight: The Battle of Whitney’s Lane & Military Occupation of White County, Arkansas, May & June, 1862. More books dealing with the Civil War in the Far West are cropping up and I found three that sound like they might be worth a look. Not much to go on beyond title and author at this point. 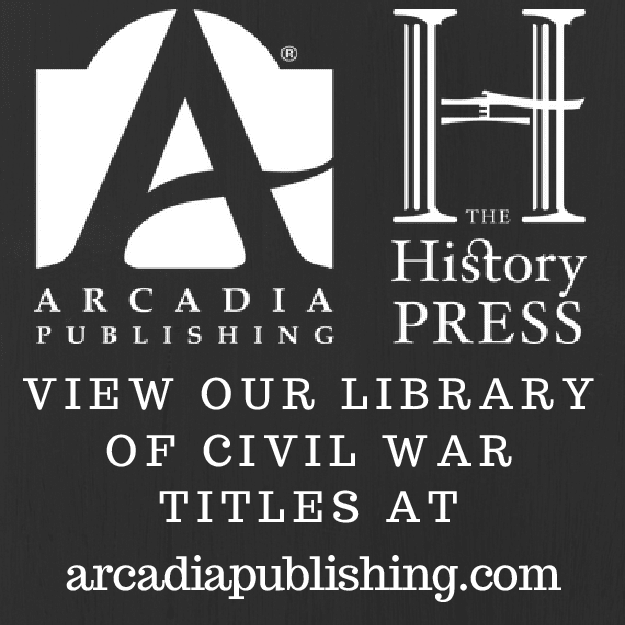 University of California Press does not typically publish books in our favorite field, but early 2015 they will release Civil War Wests: Testing the Limits of the United States edited by Adam Arenson and Andrew Graybill. The table of contents can be found here. In the fall of this year, we can expect Monika Trobits's Antebellum and Civil War San Francisco: A Western Theater for Northern and Southern Politics . The classic, albeit a bit dated, account of Civil War Los Angeles was recently reprinted and a trip to the northern part of the state is most welcome. Finally, around the same time and from the same publisher will be Confederates in Montana Territory: In the Shadow of Price's Army by Ken Robison (The History Press). I wasn't terribly enamored with the author's previous book on Civil War Montana but would like to give the second effort a chance. 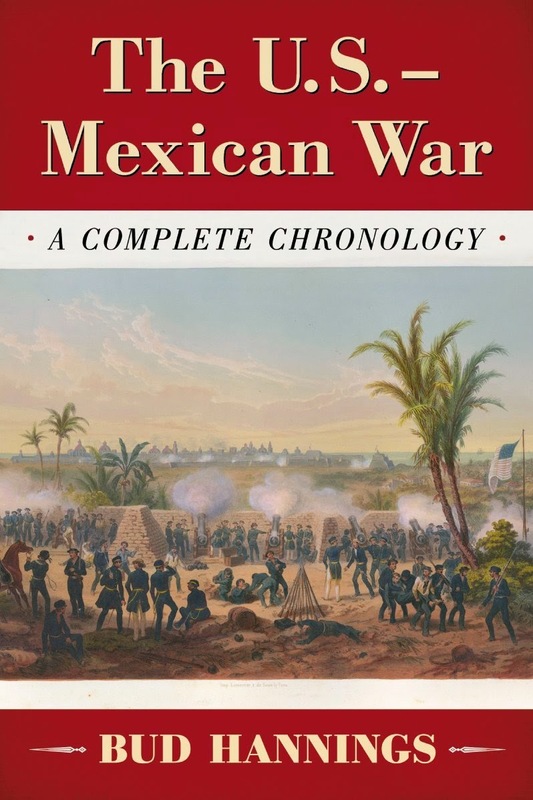 Hannings: "THE U.S. - MEXICAN WAR: A COMPLETE CHRONOLOGY"
Bud Hannings, the author of numerous chronological event registers of American wars (including a massive Civil War tome), sets his sights on another 18th Century conflict with The U.S. – Mexican War: A Complete Chronology. He begins the book long before 1846, with yearly sections stretching all the way back to 1816. Much of this material is not directly related to U.S. – Mexican relations and the subsequent war fought between the two countries, but it does highlight other American foreign military adventures in other parts of the world and contemporaneous Indian fighting on the continent. While the utility of some of this toward understanding the subject at hand is debatable, Hannings’s coverage of the 1830s Texas troubles clearly provides essential background context to the 1846-48 war. Entries for the war years average one every few days and can be quite extensive in nature, addressing various military, political, and diplomatic matters. Most consist of brief, paragraph length summaries (every once in a while, historical documents are reproduced in their entirety) but the most important battles are accorded special attention. Their headings are in all-caps for ease of discovery while browsing and their descriptions are often chapter length narrative affairs. Numbers data, as well as order of battle information, is recorded. Those U.S. officers that would play prominent roles in the Civil War are singled out for special recognition for their services on particular Mexican battlefields. All of the major war fronts are covered, including California, New Mexico, Texas, and the vast areas of northern and central Mexico directly affected by the conflict. Hannings focuses a great deal upon the lesser appreciated naval aspects of war, which stretched up and down the Pacific and Gulf coastlines. The reading experience will be an eye opening one for those believing the war, outside of the Vera Cruz landing, to have been conducted almost entirely on land. The famous campaigns – Zachary Taylor in northern Mexico, John C. Fremont and Commodore Stockton in California, Doniphan’s March, and the saga of the Mormon Battalion – are well documented, but so are countless other less well known skirmishes battles and guerrilla actions. The book is abundantly illustrated with reproductions of period lithography, such as one would find in the newspapers of the day. What’s missing are maps. Not only are none of the battles accompanied by tactical scale drawings, no campaign or even general area maps are included. Readers perusing the bibliography will find a collection of secondary sources published almost entirely during the 19th and early 20th centuries. None of the many excellent modern military studies were consulted, nor were any Mexican sources utilized. Given the latter, it is no surprise that the entries are very U.S.-centric in content and perspective. With those limitations in mind, The U.S. – Mexican War: A Complete Chronology does have real (though high priced) value as an unusually comprehensive register of land and sea engagements. 1. A Corporal's Story: Civil War Recollections of the Twelfth Massachusetts by George Kimball, edited by Alan D. Gaff and Donald H. Gaff (Univ of Okla Pr, 2014). Wounded twice, Kimball fought in many of the great eastern theater battles before leaving the army after serving three years. He resumed his newspaper career with the Boston Journal, writing often about his Civil War experiences. The Gaffs have reassembled these memoir pieces for A Corporal's Story, also contributing an introduction and notes to the project. 2. Chained to the Land: Voices from Cotton & Cane Plantations edited by Lynette Ater Tanner (John F. Blair, 2014). Tanner collects Louisiana slave narratives in this volume, with some emphasis on the state's apparently distinctive stamp on the institution, a Le Code Noir that set standards for slave care, religious instruction, and limited protections on the sale of children. 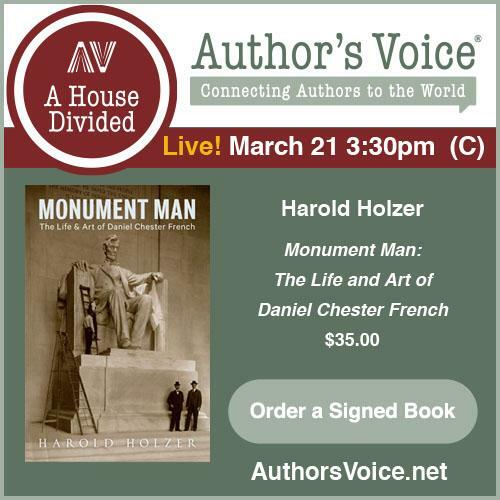 The volume is part of the publisher's Real Voices, Real History series devoted to preserving this historical material. Purcell, ed. : "THIS JOLLY LITTLE GUNBOAT: The USS Winona On the Gulf Coast and Mississippi River 1861 - 1863"
Entering service in December 1861, the Unadilla-class 90-day gunboat USS Winona was immediately sent to the Gulf of Mexico. Joining the West Gulf Blockading Squadron off New Orleans in the early weeks of 1862, the Winona ranged up and down the Mississippi River between Vicksburg and Head of Passes (with a brief excursion to Mobile) until August 1863 when the vessel returned north for refitting and redeployment. The Winona spent the rest of the war off the South Carolina coast. For a long period of time, the authorship of a December 1861 - August 1863 journal written by a Winona sailor was unknown (with several candidates under consideration). None of these satisfied Patrick Purcell. After some persuasive detective work, Purcell came up with an entirely new name (engine room coal heaver Montgomery P. Griffis) and took the next step of shepherding the Griffis material to publication under the title This Jolly Little Gunboat: The USS Winona On the Gulf Coast and Mississippi River 1861 - 1863. With entries every few days, Griffis's writing constitutes a consistent record of the movements and whereabouts of the Winona during the aforementioned period. Numerous ship-to-shore skirmishes and river encounters are mentioned, with the ship's role during the New Orleans campaign and defense of Fort Butler in Louisiana described in some detail. Pointed commentary about some of the ship's officers is also present. If one wonders how someone stuck in the bowels of the gunboat could offer such richly detailed observations, the author/editor found clear evidence of postwar revision plus Griffis also mentions that he would sometimes rush up to the main deck to view the action when not urgently needed at his post. The Griffis manuscript is really more of a diary-memoir than a true journal. Griffis faithfully records every time a coaling occurs, and the tonnage transferred, but only rarely provides insights into his own specific duties and shipboard conditions. Unlike many other Civil War diarists, he rarely if ever complains about anything. If any sailor had a right to grumble, it would have been one stationed in a steamship engine room during scorching Mississippi and Louisiana summers. Purcell performs the tasks of modern book editor fully and well. His footnotes offer additional information about persons, places, and events from the text and his parallel narrative provides excellent context both for the Winona and associated fleet operations in general. The body of the volume is divided roughly 50/50 between Purcell's writing and the Griffis diary-memoir. The original manuscript included a series of copied poems and songs [a line from one providing the title of the book] and these are collected in an appendix. Another supplement is comprised of a descriptive register of vessels encountered by Winona during its Gulf service. As Ed Bearss notes in his foreword, journals written by enlisted rank sailors serving on blockade are scarce, making this detailed one all the more valuable. This Jolly Little Gunboat is highly recommended. While perhaps not offering the expected in the way of picturing the day to day shipboard life of the common Civil War sailor (it reads more like an officer's journal), Griffis's manuscript obviously is an essential tool for anyone researching the Winona. It's also a substantial resource for those studying the Union blockade and lower Mississippi River Valley naval operations. Gettysburg attracts a level of detail fanaticism that inspires mockery and envy in equal measure. In Gettysburg, July 2: The Ebb and Flow of Battle author James Woods (probably not the actor) attempts a herculean task, that of tracking in apparently extremely minute time increments the movements of every regiment and artillery battery over an entire 24 hour period of the battle. I don't have a copy of the book so I have no idea how successful Woods's effort turned out to be, but if the author's reach truly doesn't exceed his grasp that would be quite a unique achievement.